A middle child - the seventh of thirteen children, and raised as a pious child. Soldier at age 18, and fought in the war against the Huguenots. Joined the navy to fight in the siege of La Rochelle, but illness kept him from the fight. He lived for three years in Paris, France, devoted to poetry and painting and to wild and frivolous living. Back in his home town of Cavaillon, he took over the position of his late brother as canon of Salon, a position he wanted for its income and connections instead of its spiritual significance. One night while on his way to a masked ball, he passed a shrine where a small light was burning before an image of the Virgin Mary. He was suddenly overwhelmed by the memory that a friend, Antoinette Reveillade, had prayed fervently for his salvation. He realized that there was no way he could live a life offending God and then expect to be accepted in the end. There, on the road, he had a complete conversion. Ordained in 1582. Canon in Avignon. He was profoundly affected reading a biography of Saint Charles Borromeo, and tried to take him as a model in all things, especially his devotion to catechesis. Worked as a catechist in Aix-in-Provence, France, an area in turmoil following the Religious Wars. Saint Francis de Sales called him “a star of the first magnitude in the firmament of Catechesis.” He founded the Ursulines of Province and the Fathers of Christian Doctrine (Doctrinarians). The Fathers were destroyed during the French Revolution, but an Italian branch, the Doctrinarian Fathers continues today with houses in Italy, France and Brazil. Daughter of the duke of Alsace. Wife of an Alsatian nobleman named Huno of Hunnaweyer, she lived in the diocese of Strasbourg. Mother of one; her son, Deodatus, was baptized by Saint Deodatus of Nevers, and eventually became a monk. Donated property to monasteries, and financed the construction of churches. Devoted to the poor, Hunna would help the less advantaged with any task, and was given to helping all her neighbors, regardless of class or station, with their laundry. Related to the royal family of Munster (part of modern Ireland. Studied under Saint Finian of Clonard. Founded the monastery of Lorrha c.545, and served as its first abbot. His brother monks produced the Stowe Missal, and his abbot‘s bell is preserved in the British Museum. Ruadhan’s embassy to King Dermot of Tara in 556 is recounted in the romance the Cursing of Tara where he is supposed to have cursed Dermot for violating the sanctuary of the Lorrha monastery in order to capture the king of Connaught. 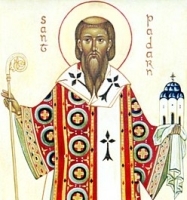 Considered a confessor of the faith, and one of the Twelve Apostles of Erin. Described by Saint Gregory the Great, who wrote about him in the Dialogues, as a man of great humility and diginity in his fulfillment of work. Legend says that one day a girl with crippled hands prayed to Saint Peter the Apostle for his intercession in their healing; he appeared to her in a dream, told her to ask for the intercession of Saint Abbondio; when she did, Abbondio appear to her in a vision, took her by the hand and healed her on the spot. Martyred five-year-old boy. Though anti-Semitic groups have claimed that Lorenzo was killed by Jews as part of some ill-defined Passover need, it’s a lie. Born to the Imperial Roman nobility. Spiritual student of Saint Peter the Apostle and Saint Paul the Apostle whose bodies she helped to bury. Martyred in the persecutions of Nero. Friend of Saint Flavia Domitilla, whom they accompanied in exile to the island of Ponza. 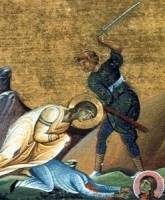 Martyred in the persecutions of Trajan. Son of Patranus. Monk at Ansion, France. Hermit near Coutances, France. Bishop of Avranches, France. Helped found the monastery of Llanbadarn Fawr in Wales where he served as abbot. Noted preacher in the area around Aberystwyth, Wales. Christian widow who became famous in rural Sweden for her charity work with the poor and sick. Saint Huna never worked in Slättåkra, but the first church in the parish was dedicated to her, and her name became associated with the town. Accompanied Saint Norbert of Xanten to Cambrai, France to preach against heresy. Remained as abbot of Saint Michael’s at Antwerp, Belgium. Monk. Abbot of Landelles Abbey, Bayeux, France. Noted for the austerity of his personal life and his dedication to caring for the area poor and sick. Abbot of Ottobeuren in Bavaria, Germany. Bishop of Augsburg, Germany. Born to the Persian nobility. 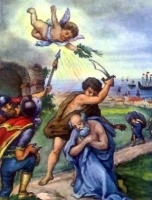 Martyred in the persecutions of Decius. Martyred in Thrace in the persecutions of Hadrian. Abbot of Moutier-Saint-Jean Abbey near Dijon, France. Abbot who founded several monasteries in Argyle, Scotland. Bishop of Metz, France from 697 to 707. 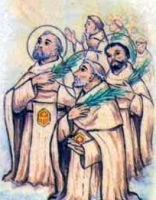 A group of Mercedarian monks sailing to Africa as on a mission to redeem capture Christians. Captured by Moors, they were tortured and executed for their faith. Martyrs.